Complete the Contact Form. I will send you an informational e-mail with more detail about my studio and policies and we can discuss any questions you may have. I like to schedule a meeting in person to get acquainted, either for you to observe a lesson with one of my current students or, in the case of a transfer student, to give your child a chance to play for me. If there is not an opening, students are placed on a waiting list. Parents of young beginners need to take two lessons of a parent education unit before the student lessons begin. There are 30 private lessons from Labor Day through Memorial Day and 9 group lessons. The summer session is 6 weeks of private lessons and 2 group lessons. Tuition is 9 equal payments during the academic year regardless of the number of lessons in a month. Payment is due in full at the beginning of each month paid by check or secure online credit card payment. 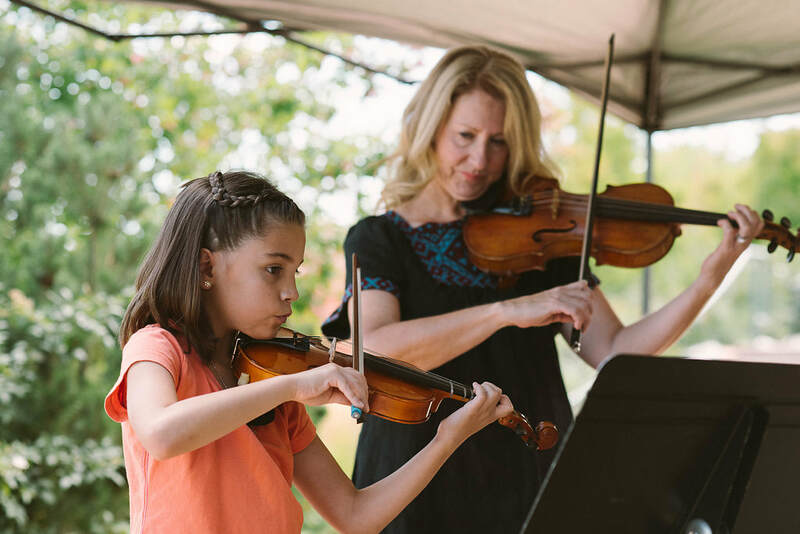 At the heart of The Suzuki Method is the Suzuki Triangle which brings student, parent and teacher together in a unique relationship of working, learning and supporting each other. This triangle is at the center of a larger shape, a star, which radiates from the triangle into these five positive qualities: character, community, family, skills and performance. Just like the triangle, these five points work together to build a strong character and noble heart and prepare your child to become a shining star. Group lessons are an essential part of the Suzuki program. Children reap enormous benefits from watching, playing and interacting with their peers. They also learn teamwork, respect, advanced musical skills such as ensemble playing and listening, and how to perform in front of an audience. In addition to learning ensemble playing and working on group pieces, group lessons are our opportunity for digging deeper into music theory. Depending upon each student's level groups meet on Thursday or Friday evenings once a month for 45 minute classes. Group lessons are included in your monthly tuition. 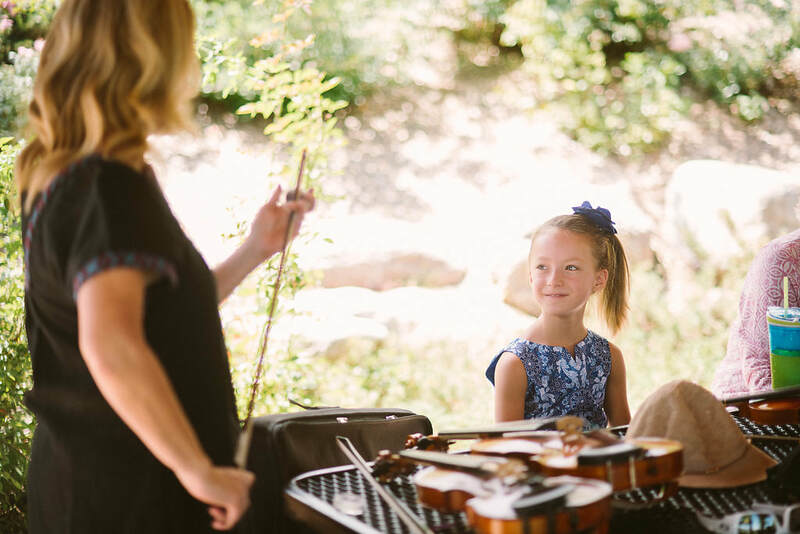 I'm not only teaching your child; I'm teaching you how to support your young violinist or violist. I will guide you every step of the way with clear instructions, ideas and support, parent training classes, parent-teacher conferences in the spring and a lending library of informative Suzuki reading materials. Another enormous benefit of The Suzuki Method is the library of resources available to both parents and teachers. The Suzuki Association of the Americas has an online forum for members, Parents as Partners video resource and Building Noble Hearts podcast to name just a few. Look into the Suzuki Association website for even more information and resources. Students play a variety of different concerts with the studio. Each year students perform in a solo recital, a group recital and a summer "Friends and Family" recital in the park. We also play a festive holiday concert each December. These give students experience in playing many different styles of music in a range of solo and group pieces. Regular practice trains the muscles and the mind. Students are given a weekly assignment and listening log. Establish a practice routine for your household which includes a set time and a place with minimal distractions. Consistency is the key. Parents will be the assistant teacher and are required to participate in lessons by taking notes and supervising practice sessions at home. I am happy to offer practice suggestions for families who are struggling with practice sessions. I recommend the following lesson lengths. Daily home practice times are the same as lesson times. Pre Twinkle* students' practice times are usually 10-15 minutes although it's quite beneficial for very young beginners to practice in several short sessions throughout the day. Listening to the Suzuki recording is a daily activity as important as practice. *Pre Twinkle students are Pre Book I students. They are beginning students or students who have recently started taking lessons.